Henry James Carpenter MSc was born in Bromley Kent in 1849. He had a professional career at the Greenwich Observatory and started at the age of 16, then he moved on to Lord Crawford private observatory at Dun Echt Aberdeenshire. He was also Astromical Assistant for Lord Linsay at Leatherhead Surrey aound 1877. He then decided to move to Oxford Observatory when he computed the transit of Venus. In 1885 he was appointed to Durham Observatory which he held the post for 14 years. 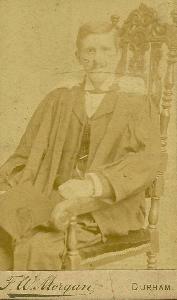 Henry was given a degree in science by Durham University and was succeeded by his son Mr H J Carpenter (tbc). He was a staunch Conservative supporter of the 'old' school and believed in conscription, as quoted by the local newspaper. He was an active member of the Durham Parliamentary Debating Society and under the Conservative Administration held the post of Minister of War. In addition was a keen sportsman with a rod and gun. He was twice married ... at the time of his death on Christmas Eve in 1899 left a widow, six sons, and two daughters. One his sons was engaged in the Boar War. He was buried in Kidlington, Oxford cemetery. Was at St. Oswold Durham Observatory at the 1891 Census, christened 5th Feb 1850 in Bromley Kent. Durham University records show that Henry took his 2 children to Durham with him in 1885 as his wife died 6 years earlier. Provo, UT, USA: Ancestry.com Operations Inc, 2007.